Argentinian composer Alberto Ginastera was born 100 years ago this year. 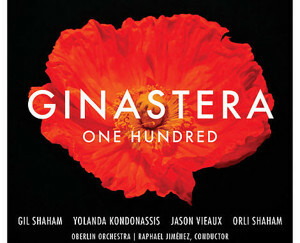 We mark the occasion with Ginastera One Hundred (Oberlin Music 16-04), a celebration of the Master and his music. The Oberlin Orchestra under Raphael Jimenez joins Yolanda Kondonassis for a sterling performance of Ginastera's "Harp Concerto, Op. 25" (1956, revised 1968), one of his most memorable works. Ms. Kondonassis is an excellent exponent of the concerto and the orchestra is inspired to give us a fabulous performance while Yolanda soars. Gil Shaham and Orli Shaham (on violin and piano) are next up in a beautiful rendition of "Pampeana No. 1, Op. 16" (1947) combining inimitably Argentinian traditional elements and Ginastera's special modernist touch. Jason Vieaux follows with a fine reading of the "Sonata for Guitar, Op. 47" (1976) which has a pronounced 20th century complexity with a channeling of the idiomatic spectrum of Spanish and Argentinian classical roots. Finally there is the vibrant "Danzas Argentinas, Op. 2" (1937) which features Orli Shaham in a perfectly turbulent and vivid interpretation of another Ginastera masterwork. The album is virtually a perfect way to remember the composer and mark his would-be 100th birthday. Every work is a gem and each performance is near-definitive. Ginastera's original way with traditional and modern elements carries the day with a program of essential works. Do not hesitate on this one. It is seminal! 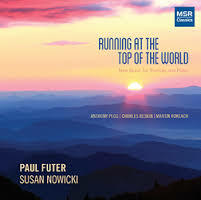 Briskly Neo-Classical Modern music from right now is the order of the day on Paul Futer and Susan Nowicki's Running at the Top of the World (MSR Classics 1610). Futer's agile and glowingly heroic trumpet blends beautifully with Nowicki's gracefully athletic piano in three winning new music works. The music has the sort of stately logic and muscular dramatics that goes back to Hindemith and forward to today. All three composers have a vividly idiomatic grasp of the trumpet and its dramatic potential. Charles Reskin's "Sonata for Trumpet and Piano" (2007) begins the program with a neo-classical flourish. Anthony Plog's "Sonata for Trumpet and Piano" (2010) alternates rapid passagework and memorably gestural kinetics with introspective breathing space. Martin Rokeach's "Running at the Top of the World" (2014) finishes off the CD with complexities and ultra-contemporary motor sonorities both stirring and rhythmically vital. The performances are gorgeous, with Futer and Nowicki keenly attuned to the music at hand and to each other. Anyone who responds to state-of-the-art contemporary brass music will find this highly enjoyable and rewarding. 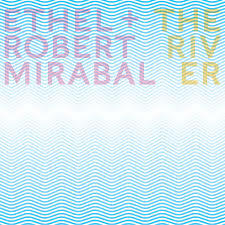 A beautifully cosmic folk new music comes pouring out of my speakers as I listen to ETHEL + Robert Mirabal's The River (Innova 946). It is the product of a seven-year collaboration between Pueblo artist Mirabal and the celebrated quartet. The music is recorded on location not far from the Pueblo River at Robert's home in Taos Pueblo, New Mexico. All sing and play miscellaneous instruments along with of course the strings and Robert's words, voice, flutes and didgeridoo. Robert's family join in on some vocals. Postmodernism and Native American tradition come together for a collection of songs variously composed over time or in-the-moment by all concerned in one way or another, a meditation on the marvelous spiritual qualities of water in motion, the river, of nature and its legacy. It is music of great strength and beauty, a meeting of a marvelous string quartet that carries with it a history and a Native American man who has song in him from an equally long (perhaps longer) and remarkable history. It is music that moves me beyond simple words. And now that I've relocated to a spot much closer to nature, it feels like these are a set of anthems I might live my life against. 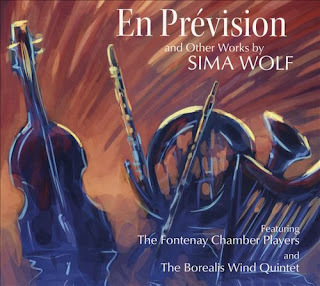 Composer Sima Wolf comes front and center for a close look at some of her pieces for chamber ensembles. 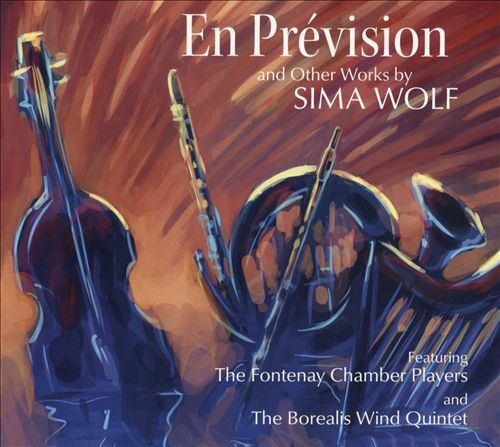 En Prevision and Other Works (SPOXXX) gives us seven such, as performed beautifully by the Fontenoy Chamber Players and the Borealis Wind Quintet. Her music has a lyrical post-impressionist flavor. She studied composition with Terry Riley and John Corigliano and branches off onto her own path in the works heard here. The pieces are well-scored for the instrumentation at hand. They fall into the tonal realm without sounding romantic or neo-classical, more pastoral and folk-like I suppose one could say. "En Prevision" starts off the program. The title translates into "in anticipation, in readiness" and focuses on a mellifluous combination of harp, flute, clarinet and string quartet. Continuing with a charm and ambiance is her "Woodwind Quintet No. 1: The Chambers of Hemera," written for the Greek Goddess of Daytime as the representative of beauty and the appreciation of all the life that surrounds us. Two short works follow: "Island" and "Birds of a Feather" for string quartet concentrate respectively on string sonorities and variations on a popular song. I must admit as to the latter that I am stumped but the music itself speaks eloquently regardless. The sonic environment shifts with "Awakening" for solo flute and then "Nocturnal Landscapes" for solo piano. Each creates a mood of exploration and a delightful tonal panorama. The finale "Brazilian Suite" for flute, harp and percussion is based on Brazilian forms--the chora, a sort of bossa nova and Afro-Brazilian roots. The music is rather irresistible and so we end an engaging and enchanting program with some heightening rhythmic flourishes. I find the entire album extremely well put together and with a positive beauty and appreciation of nuance that give us hopeful and embracing images in sound. It is the sort of music that should appeal to a broad spectrum of listeners for its lyric gentleness. Bravo Sima Wolf! 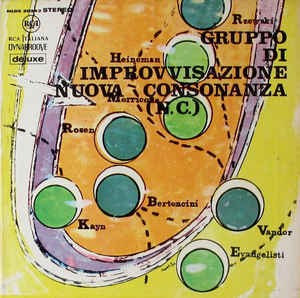 Gruppo di Improvvisazione Nuova Consonanza (NC) was from 1966 onwards one of the pioneering outfits in new music. Like their brethren the MEV and AMM, they were the first collectives to improvise new music and to incorporate live electronics and/or extended techniques into their music. The very good news is that their first, self-titled album from 1966 is in print again (Schema 944). It was originally released on Italian RCA Victor, then repackaged as Il Gruppo, the Private Sea of Dreams for RCA in the US and Canada in 1967. For some reason, happily, my local public library had a copy and I brought it home and was mightily impressed, though puzzled by its very newness. This was and is cutting avant improvisation and in 1967 it struck me as uncanny. 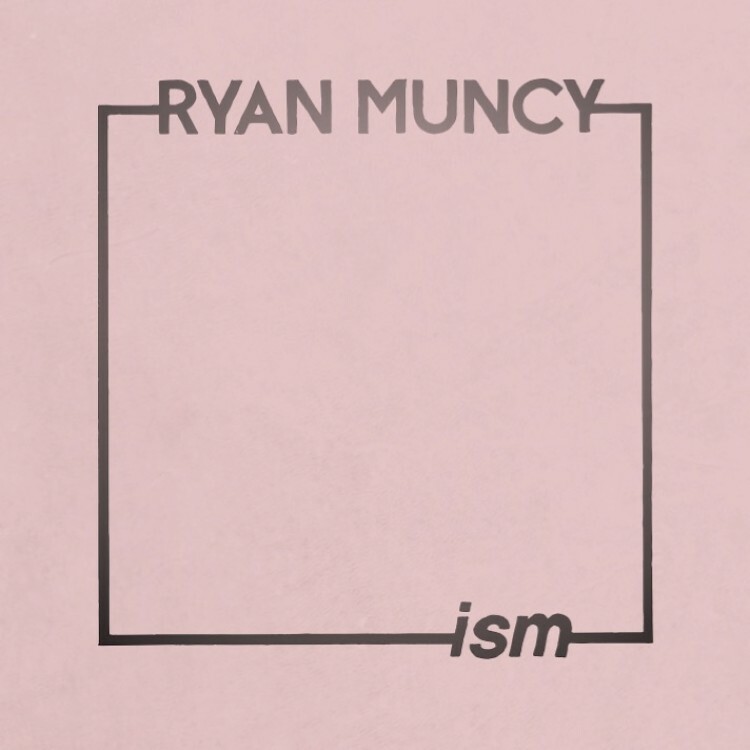 Hearing it again now with all that came after it sounds almost "normal" to me, which is only to say that the musics that followed, even the avant improv music of today owe a great deal to these primary outfits. The original lineup was made up of some impressive musical creators, many of whom went on to have long and successful careers in the new music as composers and/or improvisors--Ennio Morricone is no doubt the best known of the lot for his many innovative movie soundtracks, but Frederic Rzewski, Franco Evangelisti, Roland Kayn, have all been important figures outside of Il Gruppo as well. The other key initial members heard here are Mario Bertoncini, John Heineman, Jerry Rosen, and Ivan Vandor. Other than Roland Kayn on Hammond Organ, the instruments are purely acoustic and via extended techniques nonetheless create exotic avant universes of sound. 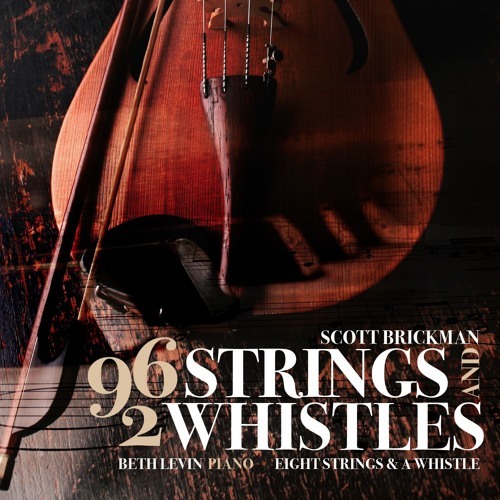 Eight improvisations grace the first album; each creates a sonic world unto itself, whether it be a matter of four players playing inside and outside a prepared piano, an eight-member chamber ensemble, a "Cantata" of four vocal extensions, and what-have-you. This album was and remains a game changer. Along with those first MEV and AMM sides it brought new music improvisation to the fore and set the pace for much that followed. All avant gardists will find this one indispensable, but it is a provocative listen all will benefit from, I would hope. Robert Casadesus (1899-1972) and Henri Dutilleux (1916-2003)--French contemporaries with varying degrees of association with the piano, give us some very substantial and lively post WWII works on this very attractive CD by pianist Cicilia Yudha (Navona 6053). Casadesus' "Sonata No. 3, Op. 44" matches up well with Dutilleux's "Sonate Pour Piano" with their neo-classical animated elegance and concentrated impact. 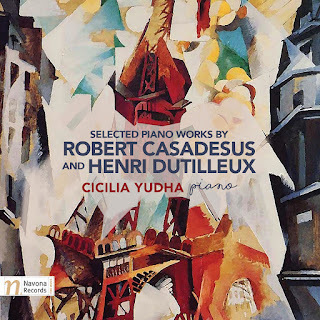 Casadesus's "Toccata" similarly compares fittingly with Dutilleux's "Blackbird" and "Au Ore des Ondes: 6 Petites Pieces Pour Piano" for immediate charm and playful lyricism that in time reveals depth. Cicilia Yudha gives the works a sparkling lightness with serious underpinnings--poetic graciousness and exploratory movement. It's the sort of album that serves admirably as a break between heavier listening. Its French luminescence has a progressive modern edge and a natural quality that sounds unforced and straightforwardly direct without seeming in any way incidental. Barney Childs (1926-2000) may not be a name at the tip of your tongue when you think of modern American composers. 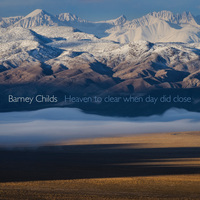 Yet the collection of chamber works entitled Heaven to Clear When Day Did Close (New World 80779-2) gives us a finely etched portrait of some essential Childs music, sharply defined, clean-lined, with a refreshing clarity. The works cover a wide span of his output, from 1951 to 1981. We hear works for solo piano, clarinet, two clarinets, solo flute, contrabass and clarinet, bass drum and a work for an "unspecified combination of five wind, string, percussion and/or voice" (here flute/piccolo, bass clarinet/bassoon, contrabass, percussion and piano). A pupil of Carlos Chavez, Aaron Copland and Elliot Carter, his music draws upon modern classical traditions, and open form works owing something to John Cage. 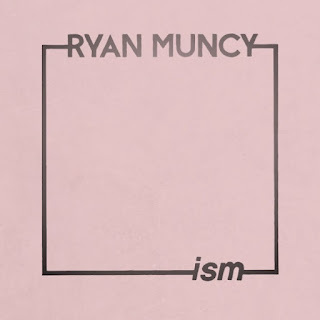 Improvisation and aleatory forms figure into much of his music but overall there is a readily communicating high modern classical clarity to these chamber works. The performers are exemplary, the music striking and the results quite memorable. This release offers a nicely paced retrospective of his chamber works. I recommend it highly. In England's baroque era John Blow (d. 1708) was one of the most admired and renowned composers. Purcell was his pupil. 300 years later we remember and perform Purcell's music; John Blow does not get all that much attention. 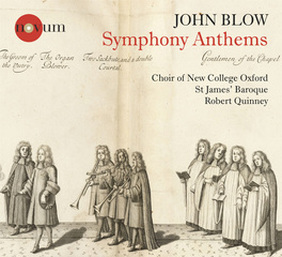 Listening to the fine performances of the Choir of New College Oxford and St James' Baroque under Robert Quinney doing six Blow Symphonic Anthems (Novum 1389) one feels like the neglect has been unjustified. The Anthems may not contain much of the irresistible melodic elements one expects of Purcell; nonetheless we hear a composer of grand invention and distinctive personality. Perhaps the first thing one notices is the special sonority of the music.The strings, according to the custom of the times, are tuned lower than their modern counterparts, giving a rich and somewhat less piercing sound. The tenor (violas) and bass violins are exact reproductions of large bodied examples of Blow's era. Catgut strings and the shorter bows of the period are used. 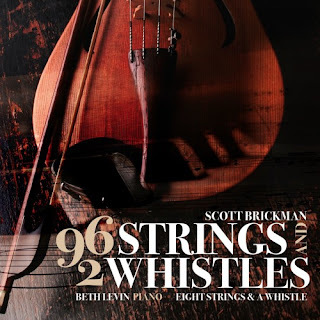 The overall effect is more resonant than a modern string ensemble, mellower. The blend with a period organ is more complete than would be the case with standard modern string instruments. The Choir of New College Oxford calls for, as was customary for the times, trebles and altos (a boy's choir) as well and tenors and basses. The overall effect is uncanny and fascinating. Imitative counterpoint abounds as does a stately unfolding and genuine artful craftsmanship, and an intimate feeling born of the smaller choir and chamber orchestral forces. This one is a joy to hear, and for me a great introduction to the music of John Blow. 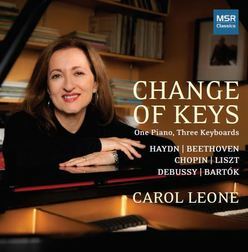 Change of Keys (MSR Classics 1616) is first and foremost a piano recital by Carol Leone. She tackles pianoforte gems from the repertoire from Haydn through Bartok. If you knew nothing else and just listened it would be something very fine. But it is more. The standard width piano keyboard of 6.5 inches per octave has been a constant since the beginning of the 20th century and the need for mass production. And yet as the liners note the average handspan for women tends to be about an inch shorter (7.9 inches) than that of men (8.9 inches). Moreover this translates to the situation where 24% of men and 87% of women have hands not spanning widely enough for the standard keyboard. Pianists can and do injure themselves when attempting difficult stretches that are often a part of the romantic to modern repertoire. Schumann was a famous example. In the late stages of our last century the Donison-Steinbuhler Standard keyboard introduced a modular keyboard series that was relatively easily installed on the standard Steinway, allowing the 6.0 inch octave as well as the 5.54 inch. With the idea that the handspan difficulties increased over time as composers often called for increasingly wider stretches, Ms. Leone demonstrates what can be done when shifting over to the shorter keyboards. So she gives us Haydn's "Piano Sonata in C Major" as played on the 6.5 inch standard keyboard, then Beethoven's "Piano Sonata No. 30 in E Major" on the 6.0 inch keyboard, followed by the rest of the program (Chopin's "Ballade No. 1," Schumann-Liszt's "Widmung," Debussy's "L'Isle Joyeuse," and Bartok's "Piano Sonata, BB88") played on the 5.54 inch keyboard. Apparently Leone adjusts with no difficulty to the various keyboards. The artistic results are what matters and each work gets the interpretive elan of Carol Leone's abundant musicality, without the strain of stretching in Promethean ways. And in the end this is a superlative recital, with the whole historical stretch spanned in delightful ways without undue hand twisting. So what matters is the beauty and dramatics of the music in Carol Leone's hands. And for all that we have a definite winner performatively! Ms. Leone is a true artist. 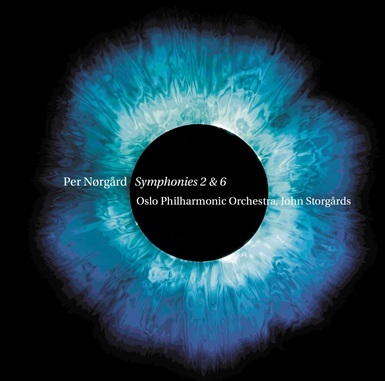 I am back with another volume in the Per Norgard series by John Storgards and the Oslo Philharmonic. This one covers Symphonies 2 & 6 (Da Capo 6.220645) and I am impressed once again with the performances. Last time I noticed the vertical qualities of the 5th and somewhat less so with the 4th. Here the 6th (1999) is about equally divided up between a temporal unfolding and singular events. The work has orchestrational depth, like an abstract painting with multiple layers and textures, it is a wealth of shades, colors and levels of grit. The work is subtitled "At the End of the Day" and you can feel the gradual shift into sunset and night if you use your imagination. It is a tour de force, certainly. Symphony No. 2 (1970, rev. 1971) is a primary vehicle for Norgard's "infinity series," where high modernist concept meets a sort of naturalistic approach to change. It is one long processual unfolding and very effectively so. Indeed, a unison in the strings gradually gives way to a series of floating note cycles in the winds and then interacts with counter lines in the strings. Change feels like the evenemential patterns of clouds passing and morphing form on a moderately windy day. It is whatever you imagine it, of course, but it fascinates via its non-specific referentiality to itself and its ability to conjure images in the mind's eye. Both of the symphonies are substantial, each "continents" in themselves, as the liners say. Storgards and the Oslo musicians weave patterns that bring out the essence of the works. I am glad to have this recording and do hot hesitate to recommend it highly. Norgard is a symphonist for our times. The music speaks volumes. 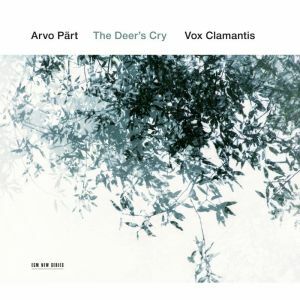 The Estonian Choral Group Vox Clamantis comes through with a stunning, second release of music on ECM, a wonderful compilation of Arvo Part works, The Deer's Cry (ECM New Series 2466). Director Jaan-Elk Tulve leads the ensemble through a well-chosen selection of Part gems, some familiar, some not, including world premiere recordings of his "Drei Hirtenkinder aus Fatima" and "Habitare Fratres." The choir is heavenly and recorded beautifully. The music once again brings us Part's early music influenced ambiance. Most of the music is homophonic and at times the sort of asymmetrical flow of text centered melody is central, reminding us of ancient chant yet of course giving us both archaic and very modern harmonic sequences presented expressively. This is a key to Part's evocative way, though there is much more to it. By now we all feel the wondrous weight of his originality, the sensuous beauty of his sonic designs. Vox Clamantis gives us extraordinary readings that are among the most definitive out there. And with the lesser known works included this is a must for all Part aficionados. This simply is some of the most beautiful music being fashioned on mother earth today! Sometimes we need to cross genres, collectively, individually. Today's album is perhaps primarily on the jazz terrain. But then it has classical chamber elements. And Jewish klezmer roots, too. It is Paul Green, his clarinet, his group Two Worlds and his interesting arrangements on Music Coming Together (Centaur 3454). It's a six member chamber jazz group with Paul, Alan Simon on piano, tenor Bruce Kraslin, drummer Bill Chapman, bassist Daniel Broad, and guitarist Michael Musillami. 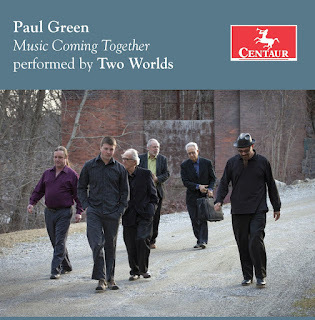 They acquit themselves well, straddling klezmer traditions, the clean lines of Benny Goodman's small groups, the ornate sensibilities of MJQ, but out of this a sound of their own, in no small part thanks to Paul's intelligent arrangements and their overall innate sense of swing. There are choice klezmer classics such as Dave Tarras's "Tarras Doina and Blues," "Der Gasn Nigun" and others. There are Miles Davis associated classics like "So What," Shorter's "Footprints" and then any number of surprises, such as Cab Calloway's klezmer-jazz "Utt Da Zay." Altogether this is refreshing, a change of pace, compelling fare. Let it have its way with your ears and you will be smiling before long, I think. As far as the later works of Philip Glass are concerned, I have decidedly mixed feelings on them. From the post-Reichian mesmerizer of works such as "Music with Changing Parts," he has taken a turn toward late romanticism, especially in his piano music. Tchaikovsky and Rachmaninov, Schumann and Chopin re-enter the picture, only the music is built on minimalist repetition, sometimes in the form of fairly simple repeating chord changes with variations in the right hand, other times whole phrases repeat, and the attractiveness of the phrase or the chordal underpinnings can vary from the rather sublime to the less so. My reaction to each work depends on whether the structured inventions appeal to me. Sometimes they do not. I reviewed the second volume of Nicolas Horvath's Glassworks on November 2, 2015. Horvath showed me then that he was a rather brilliant interpreter of the "Etudes" that made up the volume--and indeed his technical prowess and imagination made the music come alive convincingly. 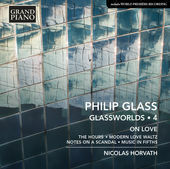 Today we have his Glassworks 4, On Love (Grand Piano 692) and it is very well performed. There are four works, the lengthy 47 minute "The Hours," a short "Modern Love Waltz," the World Premiere of the short "Notes on a Scandal" and the earlier, mesmerizing "Music in Fifths." I come off repeated listenings of this volume with the same general feeling I get with much of his later work. Some seem a little schmaltzy, some a little too simplistic, while others stick in my memory as worthily wrought. Once again Horvath does a fabulous job as the pianistic conduit, but at times there is not a whole lot he can do with the music. When there is depth, all is well. When no, less so. About half of this album attracts me. The other half I can leave alone. Bravo to Horvath in any case! 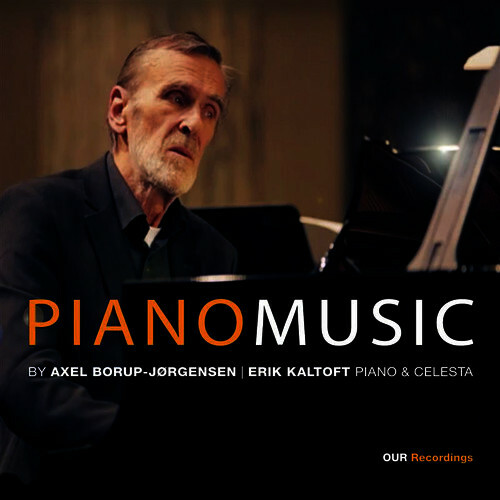 I first thought of "cantankerous" as I listened to the Piano Music (OUR Recordings 6.220616) of Axel Borup-Jorgensen. But no, a better phrase might be "courageously wayward." 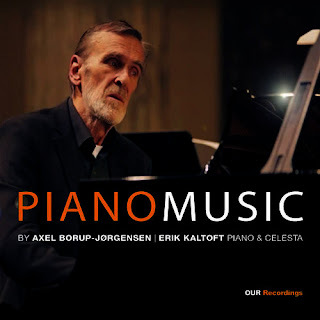 Satie, Alkan and Sorabji come to mind when you hear this well done anthology of Axel's solo piano works spanning the wide period from 1948 to 1994. He sounds more like Satie or Messiaen than the others, but in the end he sounds like himself and like the others he is in opposition to the prevailing trends in his lifetime. He is post-impressionist in his ambiance, but peculiarly, originally declamatory and sometimes inclined towards ostinatos and structured repetitions without sounding minimalist. He has a beautifully developed sense of exotic harmonic logic (as did Messiaen) which he puts to brilliant use in his sometimes whimsical, speech-like or other-worldly phraseology. What is also remarkable is how he has stuck very much to his own way and developed it in the course of the 46 years represented by these pieces. Erik Kaltoft plays the piano (and celeste) role like he was born to it, carefully nuancing what in other hands might sound on occasion clumsy. The music requires a poetic vision and a very sensitive touch to sound properly, it seems to me. Kaltoft delivers with superb performances. Anyone with an appreciation of piano ambiance and looking for an alternative to Debussy, Satie and Messiaen will in time take to this music, I do believe. But anybody who makes a serious effort of concentrated listening should end up loving this music. Or, so I would hope. Excellent! The Jewish Music and Poetry Project is an ongoing series by the chamber group Ensemble for These Times, headed by Nanette McGuinness. 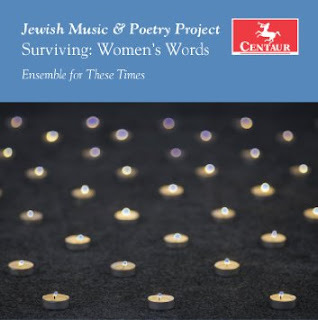 It focuses on "new music to texts by Jewish women poets or by women composers" or alternately, "music by composers who were banned, exiled or destroyed in the Holocaust." Today, I look at their latest issue, Surviving: Women's Words (Centaur CRC 3490), a series of four song cycles by David Garner, music settings of four Holocaust survivor poets: Mascha Kaleko, Else Lasker-Schuler, Rose Auslaender and Yala Korwan. The music is modern-expressionist, moving, well wrought. Nanette McGuinness is the soprano featured throughout. Her somewhat wide vibrato takes some getting used to, but in the end fits the tone of the content. She is joined by pianist Dale Tsang, and cellist Adaiha MacAdam-Somer for two of the four cycles. Both are well suited to the music. The heartrending words put both darkness and hope in a poetic light. Garner's music brings out the moods and is extremely well done. Recommended.